If somebody told me 2 years ago that I would be writing a page about biking, I would have said they were nuts. Back then, I didn’t have a clue when it came to the topic of road biking. I now have my very own road bike and I ride it as much as I can during the spring and summer. I have even competed in a few triathlons with it. The sad thing is that I am almost as clueless about road biking now as I was 2 years ago. So if you are hoping for some expert advice on this subject, you will not find it here. Almost 2 years ago, one of my closest friends was sharing her experience in a triathlon she did recently. It sounded like so much fun but I figured this type of athletic event was way out of my league. All I could do was run. She mentioned an All-Women’s triathlon thats held once a year in August. 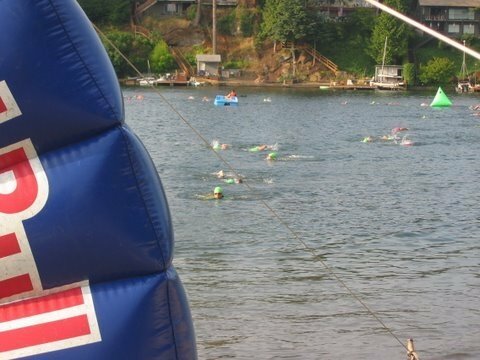 It is a very low key triathlon and women of all shapes, sizes, and ages do this event. It didnt’ sound intimidating, so why not? One of the reasons why not: I needed a bike. I considered using a mountain bike. But I kept hearing over and over again how much more effort is put into pedaling a mountain bike vs. a road bike. So, my husband and I went to the local cycling shop one day and I looked at the road bikes. There was only one in the whole store that was small enough for me. It was an entry level bike with 650c size wheels. After trying it out, I wanted it! My wonderful husband plopped down $800 for the bike and another $85 for the helmet. John is usually pretty frugal when it comes to making purchases but he wasn’t going to go cheap on the helmet. One of his biggest fears is becoming a single dad. So we left the store with my new bike and my new helmet. There was no turning back. I would HAVE to do the triathlon. So, I trained for about 4 months. It definitely wasn’t intense training. it was too fun to be intense. Going to the pool at noon to swim for 1/2 hour almost every day, and then riding in the evening with my friends. It was a blast! 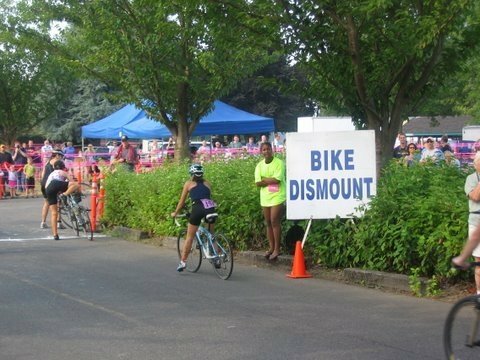 After competing in my first triathlon, I learned very quickly that the biking portion of it was not my strong point. In fact that is where most people would pass me. I already knew that the running part would be my strong point. As for swimming, I’d like to say I am about average. Ironically, out of all 3 events I enjoy the biking part the most. Just wish I was better at it. About a month after I completed my second triathlon, it was brought to my attention that maybe I would perform better if I replaced my platform pedals with clipless ones. “What? !”, I thought, “That’s nuts!”, “I don’t want to be attached to this bike by my shoes!”, “What if I suddenly need to stop?” My friends convinced me that it’s a lot easier than it looks and that I would be just fine. So early last spring, I bought some pedals and a pair of shoes. I was set. I was a little worried about using them so I practiced clipping in and out of them while in my bike trainer. This wasn’t so bad! In fact, it’s pretty easy…….in a bike trainer. My first day on the road: I really don’t like talking about it. My friend and I decided to do our very first bike ride of the year on a paved trail. I tipped over and fell 3 times before ever leaving the parking lot. I was struggling to clip out of my pedals. After falling the 3rd time, we racked up our bikes and went for a walk instead. I came to the realization that I had only 5 months to figure the pedals out before competing in anymore triathlons. So, within those 5 months I think I have fell over 20 times. My biker friends admitted to me that “falling that many times isn’t normal, maybe there’s something wrong with your pedals.” I knew it wasn’t the pedals. It was me. But what was I doing wrong? Finally about 3 weeks before my triathlon, my friend stopped to watch me as I struggled to clip out yet again. “Point your toe down and twist”, she said. As I did that, my foot practically flew out. “That’s it? !”, I wondered. “That’s what I’ve been doing wrong this whole time?!? !” Since I had my pedals, I was always attempting to clip out by pointing my toe up and heal down. I never bothered to even learn how the pedals and shoes worked. That’s pretty bad! Even for a beginner like me. But since then I haven’t had anymore falls. Well maybe just one.